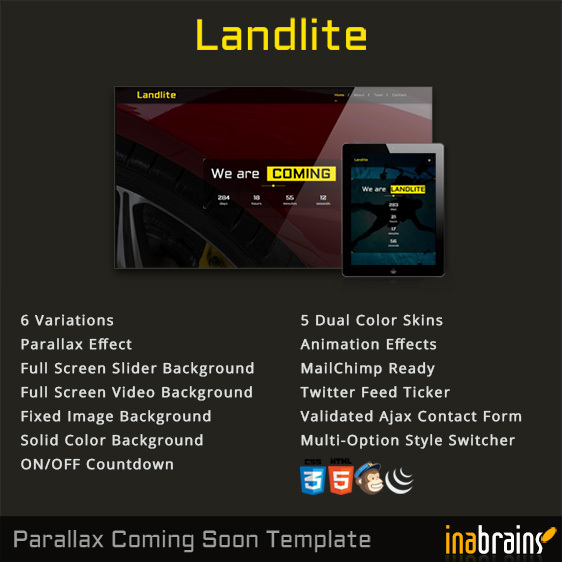 Landlite is a clean, multipurpose, flexible and responsive Coming Soon Page / Landing page created using semantic HTML5 and CSS3 coding built up on Bootstrap v3 framework. SKU: 429-0102. Category: HTML Templates. Landlite is a clean, multipurpose, flexible and responsive Coming Soon Page / Landing page created using semantic HTML5 and CSS3 coding built up on Bootstrap v3 framework. It loads with cool and modern scrolling Parallax and Animation effects which enhance the look and feel of the full page template. Being a multipurpose template it’s timer on/off option enables to make it a landing page or coming soon page. You can set up its 5 * 2 different variations with countdown timer on/off using Parallax Scroll Effects, Full background slider, Youtube Video, Fixed background and Solid color background. It also includes 5 dual color skins to beautify the page. Not only this! 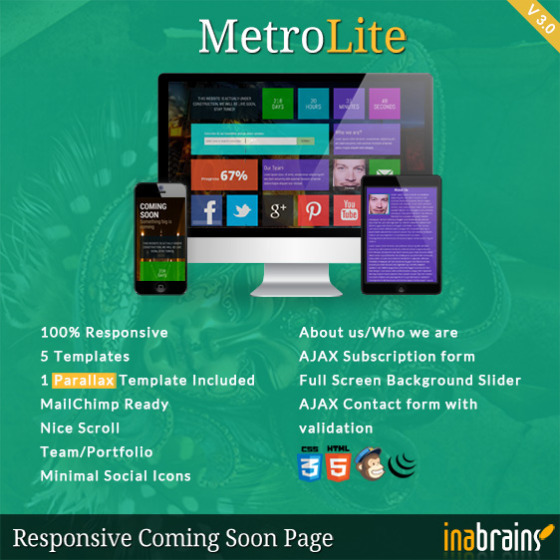 We have more live features for you to interact with your customers via working AJAX contact form and MailChimp ready newsletter subscription form. Footer of the page shows recent tweets ticker from the connected twitter account so that your customers could see your progress.Nice and smooth page scrolling effects gives a pleasant feel to the page on different browsers. The template is well documented at back end that would help you to customize the items easily.